We chose the philosophical tradition of phenomenology as the qualitative methodology to study four women school leaders. Semi-structured interview data indicated that their professional experiences impacted how their leadership practices advance social justice in their education organizations, espouse the belief that equity matter, and exemplify the torchbearers of democratic ideals. Anthony H. Normore and Gaetane Jean-Marie. 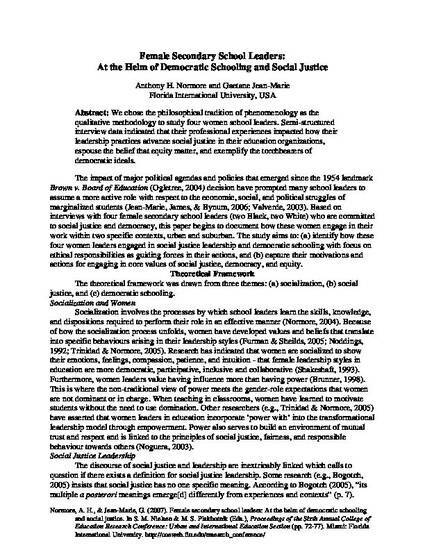 "Female Secondary School Leaders: At the Helm of Democratic Schooling and Social Justice"